Convenience is king for travelers hoping to spend as little time as possible in an airport. But for those who must hang around a while, it’s amenities that matter. And during 2014, airports around the country introduced a wide variety of very welcome amenities for travelers. Here’s the round-up I put together from my ‘At the Airport’ column on USA Today. Airports around the country are struggling to work out policies and permitting programs for on-demand rideshare services such as Uber, Lyft and Sidecar. The services are currently banned at several airports, but in September Nashville International Airport became the first U.S. airport to officially recognize Uber and Lyft and in October San Francisco International signed agreements with Sidecar, Lyft and UberX. A few other airports have issued permits to some Transportation Network Companies as well, and we’ll likely see this amenity added to the ground transportation options at other airports during 2015. This year, Nashville International Airport (BNA) introduced “drinks on the go.” Thanks to an airport-wide beer and liquor license, passengers no longer have to sit at the bar or in a restaurant to enjoy their alcoholic beverage but can take it with them anywhere in the secure side of the terminal. During 2014, shops selling recreational marijuana became legal in both Colorado and Washington and the airports in those states had to decide how – or if – they’d go about enforcing rules prohibiting passengers from taking pot to and through security checkpoints and onto planes. Most put up signs reminding passengers of the federal laws governing travel across state lines with marijuana – or did nothing – but in January, Colorado Springs Airport installed a pot amnesty box at the security checkpoint. Few travelers seem to be using the box to dispose of unused pot, but with images of the amnesty box being snapped and shared, the airport’s social media profile is certainly higher. During 2014, SFO airport opened its second yoga room (in Terminal 3, Boarding Area E) and following last December’s opening of a yoga room at Chicago O’Hare International Airport, in September Chicago’s Midway International Airport got a yoga space as well. In July, Philadelphia International Airport partnered with a local fitness equipment retailer to install stationary exercise bikes at several locations throughout the airport and this year Phoenix Sky Harbor International Airport was among several airports adding marked walking paths inside (and sometimes outside of) its terminals. 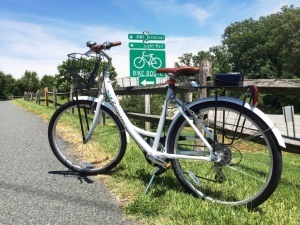 For those who would rather exercise outdoors, in August bike-share company Zagster installed a rack of 10 reservable bikes in a rack outside the international terminal at BWI Marshall. For $5 (good for 12 hours), passengers can borrow a bike and ride it around the 12.5-mile scenic outdoor trail that encircles the airport. Travelers have come to expect unlimited complimentary Wi-Fi at airports, and in 2014, the Houston airports (IAH and HOU) and Hartsfield-Jackson Atlanta International Airport joined the team of major airports that provide this much-appreciated amenity. JetBlue has offered complimentary unlimited Wi-Fi in Terminal 5 at JFK for a while now, but earlier this year the Port Authority of New York and New Jersey announced its intention to offer free 30-minute Wi-Fi sessions for all travelers at JFK, Newark Liberty and LaGuardia airports. The Port Authority and Wi-Fi provider Boingo are still working on those plans, but in a statement earlier this week said that free Wi-Fi will be available in at least one terminal at JFK, Newark Liberty and LaGuardia airports by month’s end, with the free 30-minute service at all terminals anticipated by the end of the first quarter of 2015. “Complimentary 30-minute Wi-Fi sessions are now available in JFK Terminal 4 and Newark (EWR) Terminal C, with free service on target to be available at LaGuardia’s Central Terminal Building by month’s end,” according to a Boingo spokesperson. To show off a $10 million reboot of the shops and restaurants in the post-security AIRMALL at Pittsburgh International, PIT airport invited non-ticketed visitors to come out for a one-day holiday event in early December. More than 1,500 people attended the event, which may be repeated, and “someone tweeted us asking why the San Antonio airport can’t do the same,” said PIT spokeswoman Alyson Walls. Let’s hope the smart, charming and lovely volunteers at RNO set up that booth again this year. As a gift to aviation geeks and collectors everywhere, in September, more than 20 airports around the country teamed up to create the North American Airports Collectors Series of trading cards. Each card has an iconic image of an airport on the front, fun factoids about the airport on the reverse, and are being distributed in the terminals of participating airports. Twenty-three cards are currently in the series, with Phoenix Sky Harbor International Airport set to begin distributing its trading card after Christmas. And then there are amenities that aren’t necessarily airport firsts, but are proud 2014 additions for the airports that have installed them. Seattle-Tacoma International, for example, is proud that during 2014, it not only added handy cup holders to many seating areas, but brought branches of two iconic local brands, Metsker Maps and indie music label Sub Pop, into the airport. Lambert-St. Louis International Airport is still giggling with delight over the children’s play area that opened in May. The 1,500-square-foot Magic House not only has a kid-sized plane and an air traffic control tower with a slide, it has car rental counters, a luggage conveyor belt and an airport screening area with a pretend x-ray machine. Denver International Airport is proud of the popular water bottle refill stations it installed throughout the airport terminals this year, the new on-airport pet boarding facility, and its just-plugged in “Open Windows” experimental interactive digital customer experience on Concourse B that combines 128 LED rings of light and a 3D motion-detection camera to create an 11-foot-tall interactive tower of lights that react to a person’s movement. 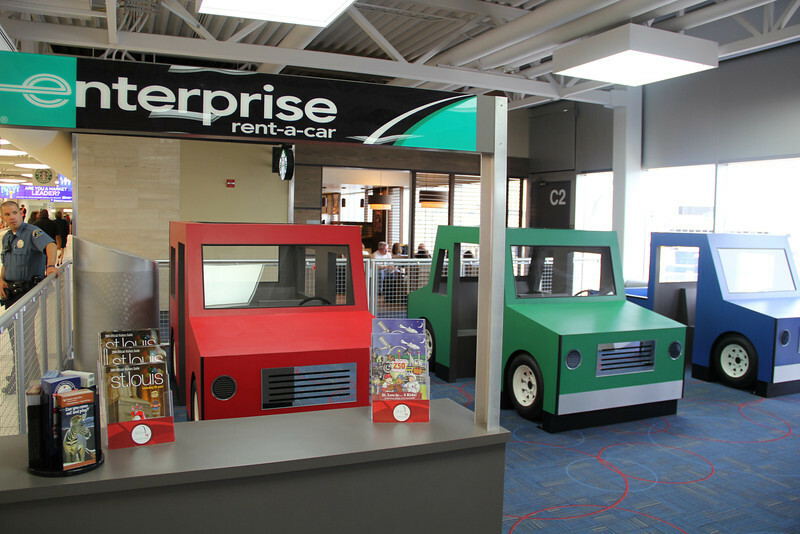 Did I miss your favorite new airport amenity from 2014? Please add it in the comments below. Remember the days when the amenities at most airports consisted of generic news and gift stands offering magazines and snacks, such as hotdogs rotating under a heat lamp, at outrageous prices? Those days are gone – for a long list of reasons – but thanks in no small part to the AIRMALL at Pittsburgh International Airport, which introduced the concept of an eclectic mix of shops right in the terminal and the promise of regular mall pricing – way back in 1992. PIT’s AIRMALL recently got a $10 million overhaul and the central core of the terminal now has 25 restaurants and bars, 35 specialty retail shops – including luxury brands such as Armani and Hugo Boss – and 10 news and gift stores. The shops and restaurants are all post-security and usually you have be flying somewhere to gain access. But on Saturday, December 6, PIT airport is inviting everyone to come by and to shop and eat and hang out from noon until 6 p.m. – whether they’re flying or not. There will be discounts and special offers, free parking, entertainment and, of course, Santa. What’s the catch? If you plan on going, you’ll need to register ahead of time so you can get through security.